This October, we will be hosting a group show in conjunction with the Raices Cultural Center and Modern Art Solutions. Join us! We are looking for artists to participate in an exhibition inspired by the theme “Water Is Life”. Artists are welcome to create pieces inspired by the doodles of Isaac Murdoch, who is the featured artist and inspiration for this exhibit series, or original works in any style on the theme "Water is Life". All art being displayed in the exhibit should aim to bring an awareness to the degradation of the natural environment and inspire a desire to protect our water, land and air. 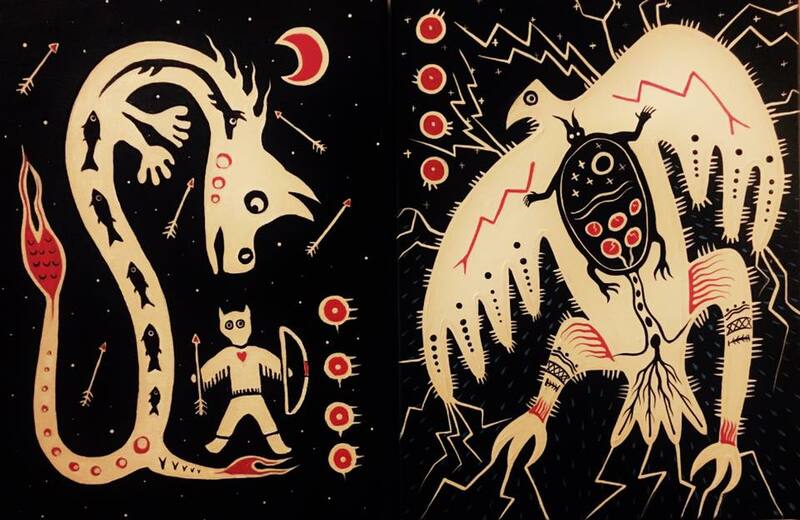 Collaboration pieces based on or inspired by Thunderbird Woman and other doodles by Isaac Murdoch, (examples of Isaac's work can be seen below). Original artwork inspired by the theme “Water Is Life” or the related themes “Land Is Life”, “Air Is Life”, the connection between culture and nature and/or the protection and preservation of nature. All mediums accepted, please bring submissions ready to hang on the wall. Chamber 43 record shop will feature a solo exhibit of Isaac Murdoch’s digital prints which revolve around protecting and revering nature, including the water, air and land. This exhibit will focus on the connection between culture and nature and the history of indigenous and first nations peoples as protectors of the water, land and air. Blank Space Highland Park will feature another solo exhibit, Our Plastic Waters, by artist Lisa Bagwell, who crafts sculptures out of garbage, mainly plastic. This exhibit will highlight the problem of plastics in our waters and encourage attendees to rethink the use of single-use plastics in their day to day lives. There will be poetry, music, artist talks and Ojibwa legends presented during the opening reception event. This will be a dynamic program and we welcome any additional suggestions or ideas from participating artists. For more information about the exhibition, and for details on the submission process, see the link below. Please be sure to share this call to art with any and all artists and arts groups you know in the area to help spread the word so we can ensure a successful event with a diverse range of artists represented. Tiger Art Supply will be closed between August 1 and August 20. We will re-open on August 21 with back to school supplies fully stocked. Between August 21 and September 9, we will be running a BACK TO SCHOOL SALE- students and faculty will receive 20% off while all other customers will get 15% off. July 24 marks the 1 year anniversary of Tiger Art Supply! We wish to send out a huuuuge thank you to each and every one of our customers who made this first year of business possible. We will be holding a short one year celebration 30%off SALE between July 25 and July 29th. OPEN STUDIOS, COMING UP JUNE 11TH 2017! Highland Park's annual open studios with take place on June 11th this year. Open Studios is a self guided walking (or biking) tour wherein artists generously open their home studios and three locations on the main avenue will host group shows. Below is a map of the event. We will be co-hosting a group of artists with Modern Art Solutions in the warehouse behind 421-427 Raritan avenue. Look for the signs which will lead you through one of two doorways to the warehouse(pictured below). THE HIGHLAND PARK STREET FAIR WAS A SUCCESS THIS YEAR. OUR TABLE INCLUDED SUCCULENTS AND CACTI ALONGSIDE A SAMPLING OF NOTEBOOKS, PENS, STICKERS, CLAY AND WATERCOLORS. IF YOU MISSED THE STREET FAIR, YOU CAN FIND US AT ARTS IN THE PARK THIS SEPTEMBER.